Construction of the Clarence Correctional Centre is delivering job and training opportunities to the Clarence Valley with the support of the NSW Government's Infrastructure Skills Legacy Program. 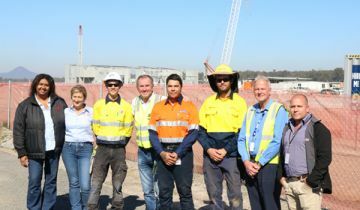 Member for Clarence Chris Gulaptis today visited the site to meet three of the newest apprentices employed on the project. '17% of the project workforce are under the age of 25 and a quarter of the tradespeople on site are apprentices – these are amazing statistics for our community,' Mr Gulaptis said. The Clarence Correctional Centre is the fourth project to be a part of the Infrastructure Skills Legacy Program (ISLP) which is an initiative to boost the number of skilled construction workers and create fresh pathways across the state. Deputy Premier and Minister for Skills, Small Business and Regional NSW John Barilaro said the ISLP sets minimum targets for the number of apprentices, women and indigenous workers employed by companies that win contracts to deliver major government infrastructure projects. 'We want to make sure that by the end of construction, there is a generation of skilled workers in the local area that can continue to contribute to their communities in the future,' Mr Barilaro said. Paul Cassel, Project Director from John Holland announced today that they are meeting and exceeding the majority of their targets. 'Apprentices currently make up 24% of the trade workforce, surpassing the 20% target set for us,' Mr Cassel said. 'There are also 10% of Aboriginal and Torres Strait Islander people in general and civil construction positions, exceeding our target of 8%. On 1 July 2018, the NSW Government commenced with the state-wide rollout of its Infrastructure Skills Legacy Program across all major Government infrastructure projects.